Kate Atkinson has a gift for blending fiction with historical detail. Life After Life (2013) and its companion, A God in Ruins (2015), are brilliant evocations of England, set predominantly during World War II and its aftermath, that use their period settings to investigate complex stories about the mutability of identity. 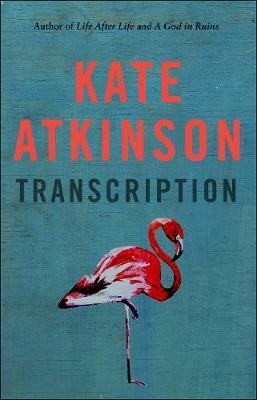 Atkinson’s latest novel, Transcription, mines a similar historical period. It’s inspired by real events the author uncovered in National Archive files, in particular, the story of a British spy who posed as a Gestapo officer during the so-called ‘Phoney War’ (1939-40). Transcription begins with a short sequence set in 1981 in which Juliet Armstrong has an awkward encounter with a ghost from her past. Shifting back to 1950, we see Juliet working for the BBC’s school’s programming division, helping them repackage British history for educational purposes. Atkinson swiftly heads back to 1940, from where the bulk of the novel’s action unfolds. We see Juliet at eighteen, plucked from a secretarial pool in Security Services by the tweed-clad Perry Gibbons to be his ‘girl’ in a vague corner of MI5. Juliet’s weapon is a typewriter. Her assignment – to spend her days in an apartment transcribing conversations taking place in the adjoining room between a spy, Godfrey Todd, and the ‘home grown evil’ (Nazi sympathisers) who divulge their secrets to him. Before long, Juliet has her own undercover identity, bringing her closer to the chilling, often ludicrous nature of spy work. Written with smart, sharp, funny prose, Transcription’s multiple pleasures and thrills are frequently unexpected. In Juliet, Atkinson has fashioned a protagonist at first innocent then scathing of what she sees. The theme of ‘transcription’ takes on a deeper meaning as Juliet learns that the dark shadows of espionage and war are protracted and inescapable. I couldn’t put Transcription down. I think it’s a page-turner of the highest calibre.